Cristian Mandeal studied piano, composition and conducting technique at the Bucharest Music Academy. Later, he perfected his conducting skills with Herbert von Karajan in Berlin and Sergiu Celibidache in Munich. After gaining experience as a choirmaster at the Bucharest Romanian Opera, Cristian Mandeal was appointed permanent conductor of the Targu Mures and Cluj Philharmonic. He has also served as permanent conductor of the George Enenscu Philharmonic Orchestra in Bucharest since 1987, where he was general music director from 1991 until 2010. Moreover, he was the artistic director of the George Enescu Festival and Competition between 2001 and 2003. He is currently active as the permanent conductor or artistic director of numerous symphony orchestras in Spain, Italy, Denmark and Israel. Cristian Mandeal has made appearances as a conductor in four continents, 31 countries and 26 capitals. 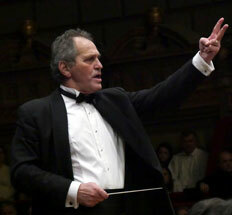 As musical director of the George Enescu Philharmonic Orchestra he has taken part in more than 30 international tours. He is a welcome guest with the Dresden and Berlin Staatskapelle, the Munich Philharmonic, the Frankfurt Radio Symphony, the Santa Cecilia Orchestra in Rome, the Catalonia National Orchestra as well as the Hallé Orchestra in Manchester, where he was active as principal guest conductor for five years. He has conducted some of the world’s leading orchestras, among them the Vienna State Opera Orchestra, the DOB, RSO and RIAS orchestras in Berlin, the City of Birmingham Symphony Orchestra, the Leipzig Symphony Orchestra, the Royal Philharmonic and the BBC Orchestra in London, the BBC Scottish Orchestra, the Czech Philharmonic in Prague, the Brussels National Orchestra, the Moscow National Orchestra, the Israel Philharmonic, the Gothenburg Symphony Orchestra, the Metropolitan Orchestra and the philharmonic orchestras of Tokyo, Helsinki, Monte Carlo, Warsaw, Sofia, Belgrade and Zagreb. Cristian Mandeal has also worked together with numerous renowned soloists such as Radu Lupu, Ivo Pogorelich, Krystian Zimmerman, Yefim Bronfman, Alicia de Larrocha, Ivry Gitlis, Leonidas Kavakos, Maxim Vengerov, Vadim Repin and Mstislav Rostopovich. Moreover, he has appeared as a guest at many international festivals.